IAM Lab recently launched a new section of its website dedicated to Impact Thinking, our translational research approach to enhance human potential in health, wellbeing and learning through the arts. 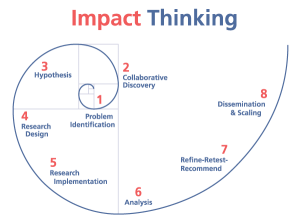 Impact Thinking is an eight-step model designed to build open-source knowledge and a pipeline of arts + mind research focused on solving real-world problems. 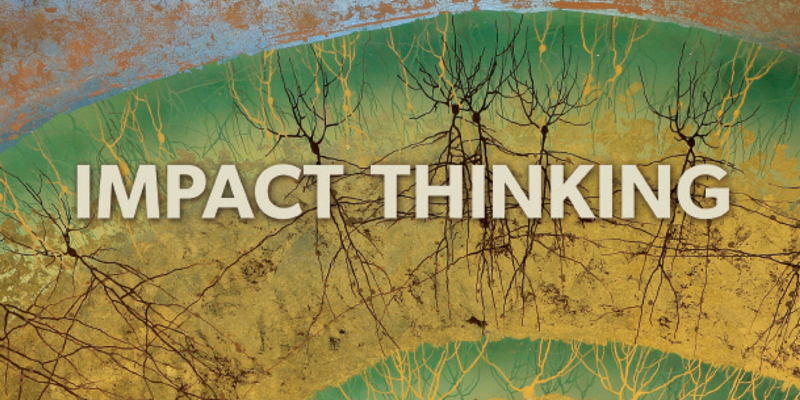 By engaging both researchers and practitioners and building upon prior research across a variety of disciplines, Impact Thinking will accelerate the spread of evidence-based arts, architecture and music interventions across different settings. “The value of the Impact Thinking model is that it’s trying from the beginning to think about how an intervention might be scaled up and expanded, if it proved successful,” said Marilyn Albert, IAM Lab Scientific Director and Director of the Division of Cognitive Neuroscience and Professor of Neurology at Johns Hopkins School of Medicine. IAM Lab is currently leading research projects using the Impact Thinking model in healthcare, community and industry settings with a wide range of partners. IAM Lab’s project with the Center for Music and Medicine at the Peabody Conservatory seeks to understand whether guitar lessons can improve motor function and mood among individuals with Parkinson’s disease. With Kennedy Krieger Children’s Hospital, the Impact Thinking model is being used to design and test a personalized sensory healing hospital room for children with disorders of consciousness. In the Baltimore community, IAM Lab has partnered with Creative Alliance, using Impact Thinking to explore how a new community arts center can improve a variety of measures of health, wellbeing and learning across generations. 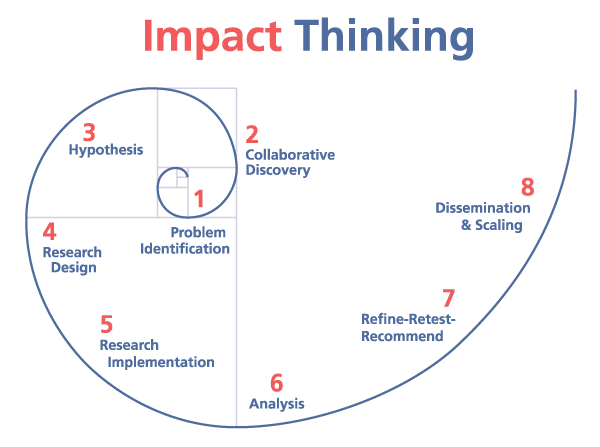 A signature element of the Impact Thinking model is Collaborative Discovery—a learning phase that examines the identified problem from both traditional academic literature and non-traditional sources like interviews, practice scans and working groups with researchers and practitioners across multiple disciplines. IAM Lab’s research projects are also connected by a growing central hub of knowledge on potential ways to validate measures that can be used to assess biological and behavioral outcomes. Advances in sensors and imaging are opening up new ways to assess the impact of arts and aesthetic experiences. Over time, as the number of research projects using Impact Thinking grows, this central hub can become a tool for researchers and practitioners globally, helping to strengthen and standardize translational research in neuroaesthetics. IAM Lab will publish case studies of Impact Thinking research projects as they are completed. For more information on Impact Thinking and the IAM Lab’s current research projects, visit our new page. Written and reported by Sarah Pitcock Lohnes, Strategic Initiatives Manager at IAM Lab and co-author of Impact Thinking.